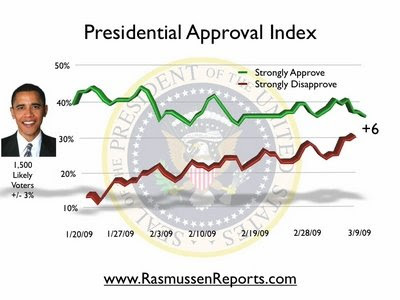 Even with the lapdog media carrying his water for him Barack Obama continues to slide in the polls after serving less than two months in office. Thirty-two percent (32%) now Strongly Disapprove of the President’s performance, the highest level of disapproval measured to date. The rising negative is driven by Republicans, 58% of who Strongly Disapprove of Obama’s performance. Since Inauguration Day, Republican opposition has doubled. Obama’s approval index is now down to six points. To be fair, the fact that Obama still has a 6 point advantage is significant considering the Dow has dropped faster under Obama than any other new president in 90 years. He hasn’t exactly had a stellar start.